Rachel Zimm: I'm Not Old, I'm Classic. On Friday night, we took off for Indiana when Steve got home from work. It was a late drive, but a beautiful one, chasing the sunset and its pink and blue striped skies. We had Jimmy John's subs for dinner, and got some quiet time to talk once the boys were asleep. 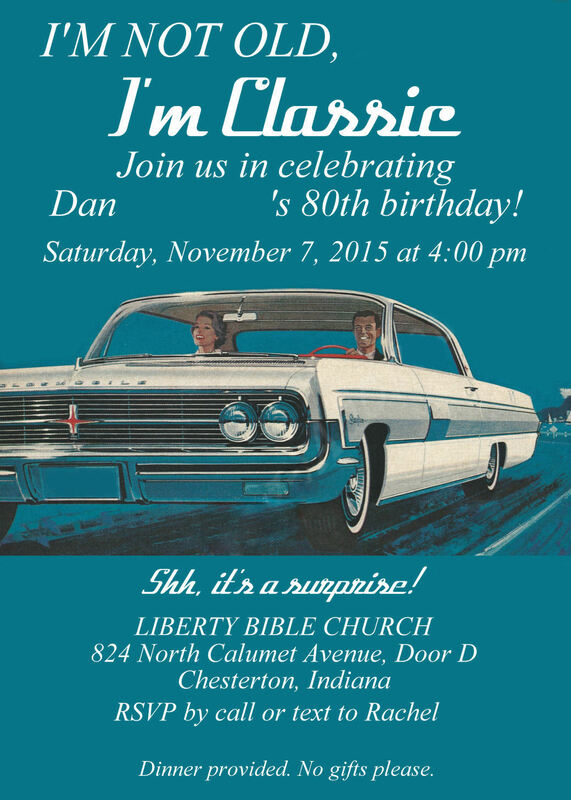 We rolled into town around midnight, excited for the next day and Grandpa's long-awaited 80th birthday party. My Grandpa Dan is one of the most special men in my life. My family members and I all filmed little segments for Grandpa about our favorite memories of him, and we played the video during the party. "I'm Rachel, Dan's youngest granddaughter. I have a lot of little kid memories of my Grandpa: things like him passing us Werther's candy in church, or driving us around in his white car and his black leather jacket. I always picture him smiling. But my favorite memory of my Grandpa was six years ago when he walked me down the aisle to my husband Steve. I chose my Grandpa to walk me because we lost my dad when I was about four, and my Grandpa became the best example of a gentleman to me. He's always been a true gentleman: a man of faith, kind to everyone, generous to a fault, and he would do anything for his family. I love you, Grandpa! Happy Birthday." Almost the entire extended family was able to come to the party, and we were glad to get our group shots right before the party started. Grandpa with his three daughters. My grandpa had one niece come all the way from Oregon, one from North Carolina, and two nephews from Nashville. I don't think these cousins have ever had their picture taken all together. Grandpa, I hope you had the best time at your party! You are so loved, and I am glad that everyone could come out and tell you that on Saturday. Happy 80th Birthday!! Aww this is so sweet! He sounds like a wonderful man....apparent by the amount of people who showed up and celebrated him! I can't believe your grandpa is 80! He looks great!! I love the invitations you designed. He sounds like a wonderful man. To say someone is a gentleman, I think that is one awesome compliment!! I love this! It looks like you had so much fun with your family!